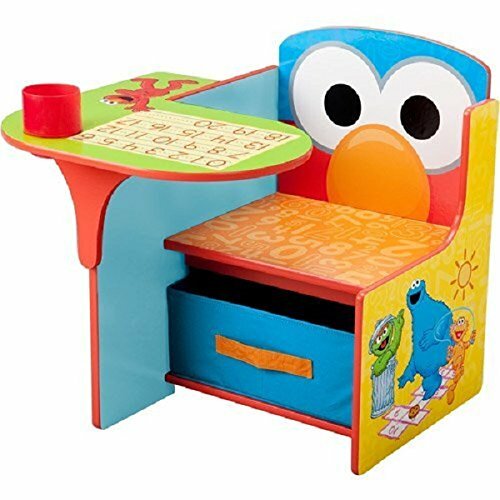 The sesame street desk & chair with storage bin is a smart and cute addition to any child's room. A perfect place to color, play or study, this kids desk and chair makes things easier for kids. The flat working surface is large and has a cup holder for added convenience. The chair with under-seat storage gives your toddler his or her own place to learn and grow. Besides just being functional, this toddler desk and chair set is fun and colorful to look at. With shades of blue, red, green, and pictures of cartoon characters seen on the sides, the desk set is a fun way to get your kid started with learning. The sesame street desk & chair with storage bin is made from MDF material for durability. If you have any questions about this product by Sesame Stree, contact us by completing and submitting the form below. If you are looking for a specif part number, please include it with your message.